The first donations from developing countries to the Green Climate Fund mark the modest beginnings of change in the relationship between North and South in the fight against climate change. EURACTIV France reports. Hopes of collecting significant contributions to the fund for reducing CO2 emissions in the developing world dwindled as the Lima Climate Conference (COP 20) drew to a close. Delegates from the 192 countries of the United Nations Framework Convention on Climate Change (UNFCCC) spent two weeks in the Peruvian capital negotiating the terms of a binding set of climate change targets, to be finalised and adopted at the COP 21 conference in Paris in 2015. This is no small objective. The COP 21 will be the international community’s last chance to reach an international agreement with the power to limit the global temperature rise to +2°C by 2050 and to keep global warming down to sustainable levels in the long term. Just hours before the end of the conference, Romain Benicchio, Oxfam France’s representative in Lima, said “we are working towards a decision on the form the different national contributions should take, but on other subjects nothing seems fixed, and the proposals from the various groups of countries have been left on the table”. The countries remain divided on a number of issues, including the level of contributions they should make to help developing countries reduce their CO2 emissions and adapt to climate change. Romain Benicchio said “some developing countries need predictable finances to know whether they will be able to fund their action against climate change”. The most developed countries have promised to provide 100 billion dollars per year by 2020 to help finance the poorer countries’ efforts to adapt to climate change. But in the latest draft decision negotiated in Lima, the question of finance had made little progress. The draft “took into account a proposal by the countries of Africa and Latin America, asking the developed countries to describe how they will to achieve the 100 billion dollar objective, and to provide a detailed plan for how they will raise the money over the coming years”, according to Oxfam. But it is still unclear how such a large amount of money will be raised, and the G77, a group of developing countries, is growing impatient for answers. The tensions between developed and developing countries crystallise around the question of funding, but when a binding agreement is signed in Paris in 2015, they will all have a share of the responsibility. This is a step forward from the Kyoto Protocol, which differentiated between developing countries, known as “Annex 1”, and developed countries, or “Annex 2”. The Annex 2 countries were judged to have a greater share of the responsibility for climate change, and were thus given stricter objectives. According to the site RTCC, Anwar Hossain Manju, the Bangladeshi Minister for the Environment, said “we are probably expecting too much of the industrialised and developed countries, because today all countries are suffering from the same social, political and economic circumstances”. The previously clear relationship between a country’s economic power and their historic responsibility for global warming has become blurred. Some developing countries, like Mexico, Chili, South Korea and Panama have also contributed to the initial capitalisation of the Green Climate Fund, which reached its objective of raising 10 billion dollars before the end of 2014 during the Lima conference. If the Green Climate Fund is mainly financed by the developed countries of the North, Romain Benicchio of Oxfam believes the participation from certain southern countries “sends out a very important message in the context of the negotiations”. The question of differentiating between the contributions of the developed and the developing countries is still far from being resolved, but awareness about the responsibility of the world’s future economic powerhouses, such as China and India, the world’s 1st and 4th largest emitters of greenhouse gasses, is on the rise. The G77 has renewed its calls for the climate agreement to be sensitive towards the economies of developing countries, as well for more information on how the promised 100 billion annual dollar fund to help developing countries will be financed. The Group of the Least Developed Countries, an assembly of 48 governments, has also expressed its support for the demands of the G77. 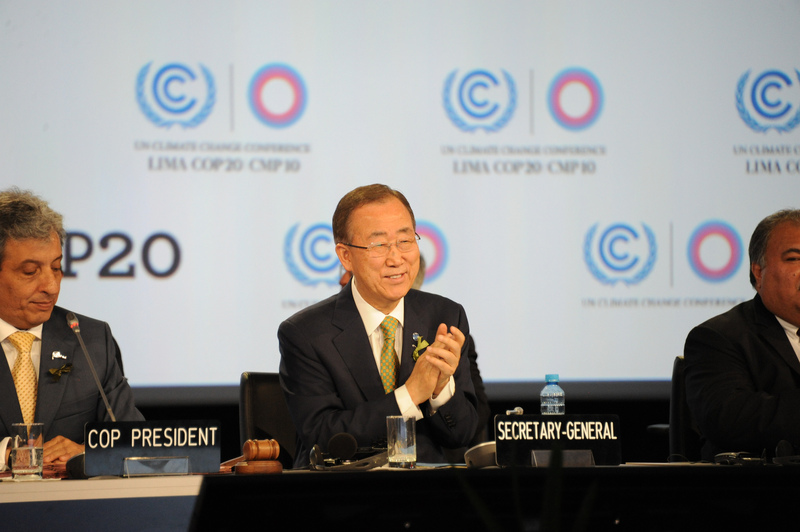 The twentieth Conference of the Parties (COP20) of signatories to the United Nations Framework Convention on Climate Change (UNFCCC), held in Lima from 1 to 12 October 2014, is the second of three conferences that, it is hoped, will culminate with the adoption of a new international agreement on climate change action in Paris in December 2015. At the end of current conference, France will become the "incoming President-Designate" of the COP. As such, it will work alongside the current Peruvian Presidency and will take part in daily meetings in the COP offices. The Peruvian presidency will have the power to summon French ministers for meeting and negotiations.